There are a variety of studies which show that people who weigh themselves regularly are better at losing weight and keeping it off. If you don’t have an idea of how much you weigh, there is no telling how many pounds you can pile on. If you have an unhealthy lifestyle you’ll be shocked at just how quickly you can gain weight. Below, we take a look at the top digital bathroom scales and give you some tips on finding the best one. What Are Weight Loss Scales? A traditional weight loss scale, also known as a weighing scale, is a simple device that measures your overall weight. While it doesn’t provide you with detailed readings such as body fat percentage or visceral fat level, it can give you a basic idea of the condition you are in. Although Body Mass Index (BMI) readings shouldn’t be your main method of determining body composition, they can give you a decent idea of whether or not you’re overweight. Traditional scales look quite primitive compared to modern day digital models which are usually accurate to within 0.2 pounds. More advanced scales measure all of the above metrics and more which can give you a better overview of your health. Why Do I Need Weight Loss Scales? If you don’t know what you weigh or how much you should weigh, there’s no way of knowing how far overweight you’ve drifted. There are countless medical studies which clearly show the dangers associated with carrying excess weight. Overweight or obese individuals have a much greater risk of suffering from medical conditions such as Type 2 diabetes, hypertension, stroke and heart attack among other things. An increasing number of people are struggling with their weight. The combination of calorie-rich and nutrient-poor foods and lack of exercise is really taking its toll on society. If you embark on a weight loss program and slip up along the way, a weight loss scale is a handy way of telling you how far you’ve come on your new diet. Instead of going back to your old ways, you can be buoyed by your weight loss to date and determined to continue on the right path. We believe this is the best scale we’ve reviewed to date because it offers everything a modern body monitor needs. If you’re a serious athlete, you’ll be delighted with the wide range of measurement options which include the norm (body fat %) and the leftfield (visceral fat and metabolic age). According to the manufacturers, this Tanita model is used in medical facilities due to its unerring accuracy and it is a strong and durable looking piece of equipment. It features a stunning design and can record the information of up to four people. The main downside is the lack of Wi-Fi connection but we’re willing to overlook this issue due to its many plus points. Another downside is the price; it is very expensive but if you’re an athlete or are serious about weight and fat loss, the Tanita BC554 is about as good as it gets. We’ve included this scale with a caveat; it’s NOT for serious athletes. For ‘regular’ people with fairly moderate weight loss expectations, it could be the perfect fit. The Omron HBF-514 has most of the metrics found in the Tanita model including resting metabolism which is seldom found in other machines. It uses hi-tech sensors which seem to provide an extremely accurate reading… as long as you have an ‘average’ build. If you have quite a lot of muscle mass, this scale bizarrely gets your readings wrong time and again. This Omron model has the unusual combination of having all the metrics needed by athletes but is actually very unsuitable for them! 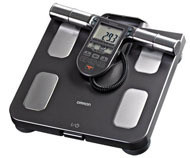 For non-athletes, it is one of the best scales on the market but could be considered expensive. First and foremost, you must realize that this scale only measures your weight and doesn’t offer metrics such as body fat %. 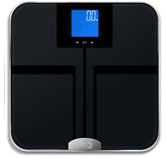 In terms of traditional scales, EatSmart is top of its class due to its accuracy, 400 pound capacity and nice design. It also has Step On technology which means your batteries should last a lot longer. It is priced at the higher end and some consumers believe it is a bit fragile. You also need to ensure it is properly calibrated in order to get the right readings. However, once you get past these minor flaws, you have arguably the best ‘old-fashioned’ scale available to buy. 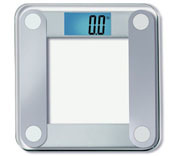 There are a number of extremely hi-tech weight loss scales that can only do one thing: measure your weight! As a result, you really only need an accurate scale and this doesn’t necessarily mean the most expensive models either. If you want more, look for an advanced model that measures body fat % among other things. If there is a store near you, take a look inside and test a few different models. When using one, place it on a flat, hard surface and measure yourself a few times in a row. Ideally, the scale won’t budge when you gently move from side to side and avoid any model that shows significant changes with the slightest movement. Although the majority of home bathroom scales will not be as accurate as the one you’ll see in your doctor’s office, it can still serve as a baseline from which you can judge how your weight rises or falls. For best results, weigh yourself just once a week in the morning at the same time on the same day. Make sure you haven’t eaten or drank anything and that you’re not wearing any clothes. When you use a scale for the first time, weigh yourself on 3 consecutive days and take the average as your initial reading. This is because your weight can fluctuate by a few pounds from day to day due to various issues such as water retention or carbohydrate intake. From then on, only weigh yourself once a week; otherwise the seemingly rapid changes in weight can either over excite you or discourage you. Quick & Easy: Thanks to the Step On technology used by most digital bathroom scales, you can simply step on the scale, wait a few seconds and step off again. There is no need to press any buttons and most models keep a record of your weight so you don’t even need to write anything down. Low Cost: You should be able to find a high quality scale on Amazon.com for under $20. 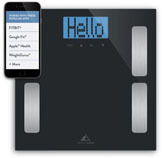 Design: Manufacturers have taken great pains to create aesthetically pleasing weight loss scales. The days of ugly bathroom scales are long gone; now you can choose between models that look stunning in any contemporary bathroom. Accountability: A weight loss scale means you are now accountable for what you eat. If you keep gaining weight, it’s clear that you need to make some changes when it comes to diet and exercise. Constant Recalibration: Modern scales are designed to find the correct ‘zero’ weight; this guarantees an accurate reading. However, you need to keep your weight loss scale in the exact same place; if you move it and fail to calibrate it again, you can expect major fluctuations. Won’t Work on Carpet: A bathroom scale will only work correctly on a hard, flat surface. Placing it on carpet, linoleum or other soft flooring will cause variations in weight which depend on the level of cushioning. The reason most people use their weighing scale in the bathroom is because the flooring is typically hard. You Must Stand Still: Once you step on a bathroom scale it’s vital for you to stand completely still. If you move around, your weight will shift across the scale and lead to an inaccurate reading. You need to stand very still on the scale until the LCD screen displays the results. General Lack of Information: Some weight loss scales can only measure your actual weight and nothing else. You can lose weight and be even unhealthier than before because you’ve focused on a low calorie diet devoid of nutrients. If you’re excessively overweight and just want to shed pounds or are in reasonable shape, one of these scales is fine. Otherwise, you’ll need something with more detailed metrics. If you don’t have a weight loss scale in your home, purchase one right away! You’ll quite possibly be shocked by how much you weigh and this information might cause you to change your lifestyle for the better. Modern digital bathroom scales are accurate, inexpensive and easy to use so go to Amazon.com to find the best one for your needs; we recommend choosing one of the trio we highlighted above. FlipBelt vs SPIbelt: Which One Should You Buy?